Naples has the biggest concentration of high-end handmade menswear in the world. Although not so much for shoes, for tailoring and shirtmaking this is the motherlode, with hundreds of tailors in the city and surrounding region, and thousands working in small factories or busily hand-sewing at home. You come here for bespoke, not for shopping. But there are still a few shops worth visiting, and we highlight them here alongside some groupings of the best tailors and shirtmakers. Many readers will visit Naples at some point, for a fitting or just to see the atelier of the tailor they’ve been using for years – and give some context to those beautiful suits they wear every day. So we include some of those we particularly like, alongside the handful of shops. Please do bear in mind that there is no way to include all of those bespoke artisans – and that is not the role of this list. The bespoke listings below are necessarily partial and subjective. Historically the biggest tailoring house in Naples, and the place so many other greats have sprung from. Rubinacci moved a few years ago from its old, curved-front shop into a much bigger space up on the hill. Here it looks down impressively on Via Chiaia, although the elevated position can also mean it is easier to miss. There is a large, deep shop selling both Rubinacci ready two wear and a variety of accessories, and a bespoke space at the back with many bolts on display. If you can, try to also see the cloth archive, which is stored in an actual bank vault. Perhaps the most famous shop in Naples, Marinella is shockingly small. There is just about enough room for two people to come in, browse the ties that are stacked unceremoniously in plastic sleeves on the tables, buy one and leave. Various Rubinacci spin-offs are also available around the shop, and upstairs, but is the ties and the charm of the tiny boutique that people come for. The other internationally known Neapolitan tiemaker is bigger, but harder to find. 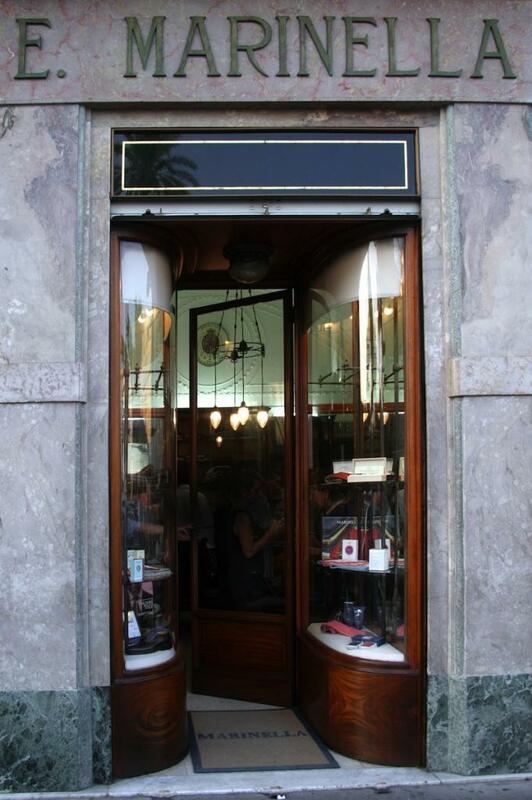 E&G Cappelli has its shop (and workshop) in the gated square at 37 Via Cavallerizza. You’ll have to ring to get through the gate, though there is also the advantage that, once inside, you can also visit Sartoria Formosa – tailoring or shirts – on other sides of the square. Jewellery has been in the Barbarulo family for four generations, although they have gone through various retail strategies: the founder was a goldsmith, current owner Cristiano’s father moved the shop to Capri and sold vintage jewellery. Cristiano opened the new shop, in a lovely arcade next to Piazza Amedeo, in 2012. His international website is called Gemellidapolso (the Italian for cufflinks) but there are also pins, chains and other jewellery for sale. Cristiano has also brought more of the craftsmanship from outside Naples into the studio, which is nice to see. 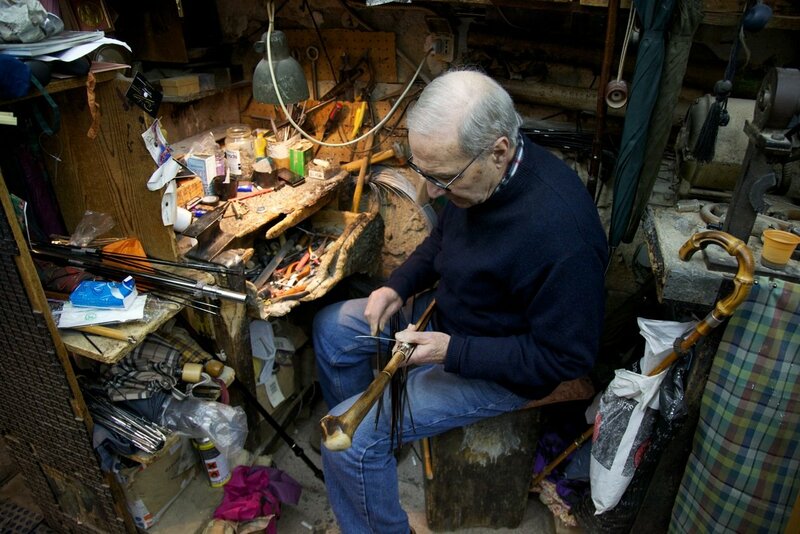 Talarico makes some beautiful umbrellas in a tiny and ancient workshop off Via Toledo. He also offers some cheap brollies, but move those aside and look out for the solid sticks in chestnut or cherry wood, with hand-sewn canopies. Mario Sr will likely be sat at his desk, which has been worn down so much it looks like a shark has taken a huge bite out of the top. And Mario Jr should be at the counter, tying on the little strips of silk or cotton that bind the umbrella’s ribs. A worthy souvenir of Naples. There used to be dozens of cloth merchants in Naples, importing and stocking cloth from Biella and Huddersfield for all the tailors around the city. Today there is one: Caccioppoli. 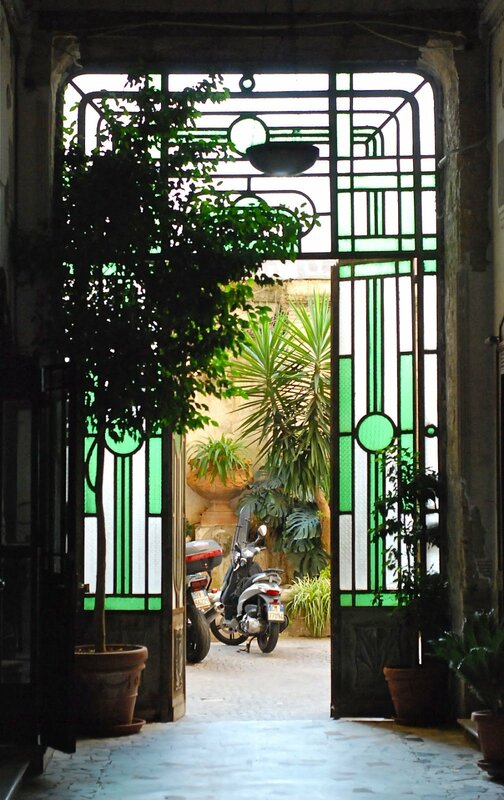 The Caccioppoli office in the east end of Naples has a lovely atmosphere to it, with three floors covering most of the city block. Customers cannot buy cloth directly in the shop, but it is worth a visit to see the latest season’s collections in full bolts, before ordering from a tailor, as well as to see the building itself. Far, far smaller than Caccioppoli, but worth a visit. Piccolo (not to be confused with shirtmaker Salvatore Piccolo) is a small shirtings shop just off Via Chiaia in the centre of town. The range of shirtings is good, if not extraordinary. There are few rare or unusual bolts you won’t find elsewhere (in contrast to, say, the Charvet range in Paris), but actual shops with shirtings on display in this volume are few and far between. Take the opportunity to reconsider shirt cloths, their textures and weaves. Visitors to Naples with an interest in classic menswear will welcome the number of small shops offering brands such as Incotex, Boglioli and other Italian smart/casual labels. There are no more than other large Italian cities, such as Rome and Milan, but far more than in the UK, US or Asia. Most of these are relatively cheap or a little outdated – Mister Fox and Milord, on either side of Via Cavallerizza, are examples of each. But they can be interesting to pop into (even chains such as Gutteridge) on the lookout for a nice tie or chino. As you might expect among the hundreds of tailors in Naples, there are a few that specialise in leather work – either making for brands, for tailors, under their name, or all three. The biggest and best-known of these is Sartoria Rifugio, and last year one of the top makers branched out on her own to found Sartoria Melina (which only does bespoke, fully handmade work). Both produce a lightweight leather or suede jacket with no canvas, just a small shoulder pad and a thin layer of fusing. The handwork is beautiful, and the nubuck calfskin a particularly nice choice of skin. Both are some way out of town and require appointments. Rifugio also has showrooms in Milan, New York and Palm Beach. Some of the great names of Neapolitan tailoring, such as Antonios Panico and Pascariello, Gennaro Solito and Gigi Dalcuore, are still around and working – and worth a visit if you can. Of course, it’s a lot easier if you are having something made, and commissioning a suit in Naples remains very good value for money (although it would require several return trips unless that tailor also travels). The ateliers of the tailors are often steeped in history, with various awards and certificates of recognition on the walls. Places like Panico or Ciardi also have tailoring accessories such as old irons, and paintings on the walls that make the place feel more like a home than a shop. Which of course, is exactly how they want it. Smaller or younger tailors are more likely to travel, and among these it’s worth seeking out Ettore de Cesare up in Vomero, and Elia Caliendo in the centre of town. Dalcuore also travels widely. There are two young and dynamic men at the head of two of the trouser makers in Naples: Cerrato and Ambrosi. Ambrosi has become particularly well known around the world, both for bespoke and ready-to-wear, with Cerrato only starting to travel recently. Both make great trousers, and generally offer a higher level of make under their own name than in those they make for the city’s tailors. More bar tacks, more pick stitching. Both are very welcoming and close by, Ambrosi on Chiaia and Cerrato on Toledo. 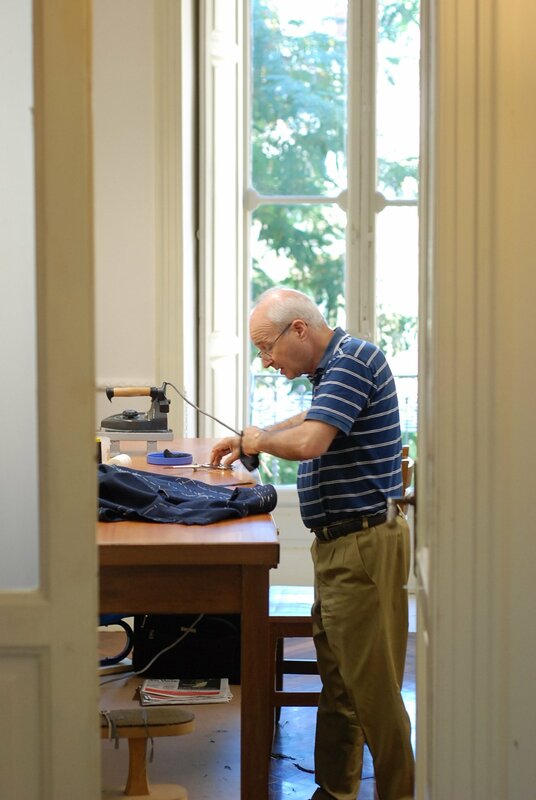 There are a lot of shirtmakers in Naples, most of which are open to visits but tend not to have ateliers with the same history and atmosphere as the great tailors. One worth highlighting is Luca Avitabile, who has built up a big international business for his bespoke and readymade polo shirts (designed with Permanent Style). In 2017 he also opened a large office on Via Toledo (same building as Solito) which is modern and welcoming. Lovely view down the long shopping street of Toledo. Anna Matuozzo is more famous and uses more handwork in her shirts. Outside of town, meanwhile, is D’Avino bespoke (not to be confused with Avino, which does both ready-made and bespoke). If you fancy travelling out to the suburbs, the D’Avino atelier is a nice place to visit and is surrounded by the likes of Attolini and Borrelli, as well as many women finishing shirts at home. You can follow the discussion on Naples: A sartorial shopping guide by entering your email address in the box below. You will then receive an email every time a new comment is added. These will also contain a link to a page where you can stop the alerts, and remove all of your related data from the site. I haven’t seen much, but what I have seen isn’t great in terms of finishing, for example. Wouldn’t this be something worth exploring? Given Southern Italy labour costs / rent the more famous Naples tailors’ are inflated to say the least. Potentially, yes, although most of the tailors I cover also travel to London or elsewhere and the costs of doing so 2-4 times for each suit are not small. Also, I’d challenge how ‘inflated’ a lot of the prices are. I have yet to meet a tailor making a lot of money. Excuse me but again I disagree . Fabio sadano, anticasartoria Leonardi and Caracciolo are quite big Sartoria’s and behind them experienced masters stands. They has they own style and finishing very good. I didn’t say all of them were young guys, I said some of them are. Hi Simon, any specific thoughts on Granata beyond the potential issues you identified (potential lack of consistency and breadth of work)? Thanks. OK, thank you. I was asking because I commissioned a suit with him; I haven’t seen the finished product yet, but the overall process was rather chaotic. I was wondering if you might have had a similar or slightly different experience. Just to close the loop on this… I did just receive the finished product and I have to say that it is very satisfactory. While there isn’t an insane amount of detail and, as Simon suggests, the finishing isn’t on par with suits in a much higher price range, it is a very honest product that represents great value at EUR 1,000. The process was a little bit difficult, but overall I have to say I’m quite happy with the result. may i ask you where to do a nice MTM shirt in naples ? then wht s your advise when it come to bespoke ? Thanks ver y much Simon. Will you make a Rome post? Neapolitan tailoring is not really my gig, but if you do get to Naples I can recommend L’Antica Pizzeria de Michele. Only two choices, and no pineapple in sight, but so good! Yes, have been to Michele – and they’ve just opened their second branch, in London! The Neapolitans say it’s not the same because their water is unique, but you can believe that or not. Interesting point on the water. There is a place in New York called Naples 45; when it opened, the owners brought some water to the city with them from Naples and asked a lab to try and match it with any water in the State. I believe they found a close match somewhere upstate, and, at least for a while, used it to make their dough! Is it worth visiting in August, do you think? Only time I can go unfortunately, but will there be much tailoring going on? Most workshops will be closed for at least two weeks that month, so I’d avoid it. It will also be stinking hot! The Neapolitan sartorial tradition actually started in the small towns around Naples, Casalnuovo above all. Many tailors who opened in Naples come from there. In these small towns there are still good tailors at lower prices . How does tailoring in Naples compare to London in terms of price? Are these gentlemen of the older generation still working, or are they supervising alongside sons (i.e. the next generation)? No, I move around each time pretty much and couldn’t recommend any one particularly. in rooms looking out across the bay to Capri and down the coast to Vesuvius. Although it is now a part of an international group of hotels, it has–unlike other luxury hotels in Naples and nearly every place else–not been so irredeemably modernized as to loose its original 19th century character. 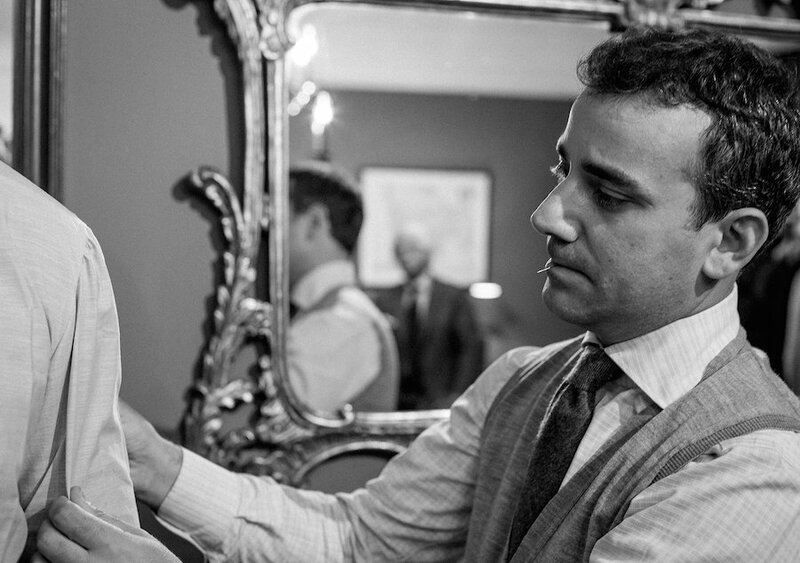 which Neapolitan tailor, including MTM one such as Kiton and Attolini, puts the most amount of handwork in their suits? In other words, which one can rival Cifonelli and De Luca in terms of make? Most of the bespoke tailors put the same amount of handwork in as most other tailors – but none as much as Cifonelli or Camps de Luca, such as hand sewn and then top-stitched seams everywhere in the lining, for example. The biggest difference between the Neapolitans and most tailors, eg the English or Milanese, the precision and fineness of the handwork, rather than the amount of it. Long time lurker first time poster, very much enjoy your articles. Last weekend I was walking down The Row for the first time with the mrs, I am new to London from Newcastle. I popped into a tailor called Jeff Banks, he was very helpful and seemed to know his stuff. I am considering placing a bespoke order for 3 suits and was told I would have some and ties included. What would your opinion be on a Jeff Banks bespoke suit? As I have never had a bespoke suit made before. I would avoid it. Jeff Banks is not a bespoke tailor. Thanks for the advice, he seemed legit but I was dubious. Thank you for bringing this review to a wider audience. Personally, I have very good experience with #7 Camiceria Piccolo. Last summer, during my Italian summer holiday, I went through the fitting process with them and received my shirts around 4 weeks later. The level of detail and hand stitching is remarkable – taking the price of (average) 160€ and the level of hand stitching into account. These have now become my favorite shirts for work. I think it would be great if you would also investigate middle-class Neapolitans and how they dress and buy/tailor clothes. In my time in Naples it seemed like normal Neapolitan gentlemen dressed better than any other group of guys in the world and it didn’t seem like they were all wearing made to measure shirts and suits. Why is there a Campari soda bottle in the image with the espresso? Your unstinting commitment to the sartorial has seen you commission a bewildering array of attire and my question to you is, were you to downsize to normal proportion, what would you keep? 2) Which three pairs of jackets and trousers? 3) Which pairs of jeans and chinos. This would be enormously helpful and would sort the wheat from the chaff. How do you manage with the language in Italy. Most of the tailors speak english. To get around in the city is the best by taxi or is there a proper public transportation system. In Naples you can pretty much walk everywhere. Basic Italian is enough to use most taxis etc. Thanks for this, Simon. Just saw Luca and Luigi yesterday, and agreed to visit Napoli after the summer. Looking forward to a look behind the scenes – it’s always nice to get some background to the things you wear! Great list Simon. Just one thing I have to add. The Marinella shop you mentioned is not the main one. It is small and gets crowded but more importantly they don’t carry their best products. So when you are on the Riviera de Chiaia and the shop is on your right hand side, walk for a bit and then you will notice the entrance to the inner courtyard of a few buildings. Enter there and on your right side you will see some beautiful stairs. Climb one level and you will see the beautiful Marinella shop. Not many people know about that and the selection is amazing. You can see ties made from their silk archives as far back as 40’s. You can even pick your cloth and order your own tie. They also have a few special bolts of fabric for suits…motorcycle helmets made by Marinella and many more interesting products. Yes, I agree. I really only go there for their ties from their archives. They are the real gems. 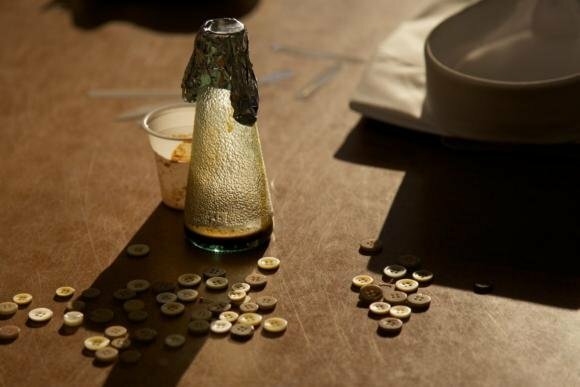 Your excellent report on Naples had a photograph of a flask and buttons, suggesting that it was taken at button supplier, that dyes to order. Would you share the supplier’s details, please? – I currently have number of Zegna Milano Easy MTM jackets and RTW pants as well as a Troino Jacket. Looking for something that would be better than that. From your blogs, looks like Elia Caliendo and Solito would be best. Which do you recommend? – I’m relatively short and small built (167cms height and a 36-36.5″ chest and narrow shoulder. Your blogs on jacket style made me wonder if a neapolitian jacket is even right for me. hoping that many others on this forum have similar questions and that yu can help. – Elia and Solito would both be great. The biggest difference is price, with Elia being quite a lot more, but with generally better finishing and quality. – I wouldn’t say that. Rather, i would say that sports jackets are better Neapolitan. But Neapolitan suits can be nice as well, just a little less formal. – It depends what you want to look like. A Neapolitan jacket will show your natural shape, rather than giving you broader or stronger shoulders. If you don’t that, that’s fine. More details here. Do also bear in mind that you are unlikely to be able to have a jacket made on just one trip. You will likely need at least two fittings and therefore see the tailor three times. – Is there an inherent disadvantage to doing a next day fitting? Is this too rushed to get good results, or, put another way, is it better to give the tailor more time between measurements and the first fitting? – When visiting tailors in Napoli, is there a lag which one must take into account as we cram multiple fitting sessions into a 1-2 day trip? Not talking about time getting from one store to another, but just the time you have to wait as they free up, or just the pace at which they offer service. For someone who hasn’t visited them at their shops, I’m trying to get a sense for whether you can really get things done in 45min like you do when they visit cities and work out of hotel rooms. Please ignore fabric selection time as that can vary. – With regards to the alteration, it’s essentially a grey flannel suit I had made 2 years ago; I do not wear it as the fit is not great. I’d be asking them to take the suit in around the waist, and whatever consequential changes are to be made henceforth. Question here is, if the final bespoke product is delivered to the client, is it reasonable to go back to the tailor and ask for a refitting, or at least some basic changes to the fit? I had pointed some of this on delivery and was asked to wear it for a bit first so allow the fabric to settle in. Just want to get a sense for the norms vis a vis follow-up service on a commissioned suit. To clarify, my measurements haven’t changed appreciably; it just doesn’t feel like a properly fitted suit. Hi Ahmed. Some big points here, but I’ll reply as best I can. – I would avoid next-day fittings wherever possible, as it is an inconvenience to the tailor (they have to stop all work to prioritise you) and usually the fitting cannot be done in the cloth you request. – I would certainly allow more than 45 minutes. Neapolitan tailors may tend to be a little more relaxed, and it’s a real pleasure taking coffee before or after a fitting as well. Don’t try to cram too much in. – This should be absolutely fine, particularly as you’ve already communicated the fact that there were issues with the final suit. Taking in the waist is also a pretty easy change. Hello Simon: I’m new to your blog and I am enjoying it very much. I live in California but we get to Italy quite often, mostly Rome. Just wondering if you have suggestions for shopping there? Robert, strictly my own opinion–unendorsed by Simon–is to check out Sartoria Ripense in Rome. Andrea Luparelli there has made me several jackets and a suit over the past few years, and I think he’s fantastic. Cheaper than some of the bigger names but with a keen attention to details and fit, and he has a great eye for what looks good on his clients. Andrea himself is relatively young (just under 50) and something of a style icon on blogs and in magazines, but his tailors are older gents from Calabria. So it feels like the best of both worlds. Thanks Max. We will be in Rome in September and will check Sartoria Ripense out, I know the street they are located on, I’m surprised I haven’t noticed it. An update from Naples this week (where it’s currently snowing!). Granata now charges €1200 for a suit, not including fabric. Add roughly another €300 for the material and you’re looking at €1500–still cheap for bespoke but well above the mythical €800 Neapolitan suits that some posters have mentioned. With all these young tailors in Naples, expect to pay cash, and don’t expect them to have shops in Chiaia although some including Granata will come to your hotel. Several more established tailors I know question the viability of the prices, but clearly the business model is about building a client base on low or no profit and then hopefully raising prices once established. Many young tailors and other artisans in Italy are happy to be working at all; they can all tell you of friends who went to university (instead of learning a trade) who can’t even find restaurant work. Biagio charges 1200 euros now because he must pay the VAT to the Italian state. Still very good value for money. The result of the first suit he made for me was average but mainly because of the difficulties of communication. We improved it and the result of the second suit is very good in terms of fit. That’s being said, it’s still a very neapolitean process with random delivery deadlines. Concerning the trousers, he subcontracts them. Would be wise to order it directly to a trousermaker. The VAT rules haven’t changed in Italy; per EU it’s always paid at every level of exchange. He raised his prices because he has enough business now that he can. With fabric the suit he made for my son came in at €1800, not counting another €100 for shipping. Still a good deal but not wildly below some more established tailors. Sorry, the total with shipping was €1800. It makes 500 euros for the fabric??? At 1,2k he’s a top value. At 1,5k you could have order to some old masters of the via Chiaia whose names will never appear here because they have no Instagram nor mail and even nor phone. Agree. My Granatas are as good as m’y Dalcuore suit (bought before it becomes trending). Only Chinese and uneducated Igent are eager to pay 3k or 4k for a suit. Ah, the mythical cheap Neapolitan suit only for locals. Often cited, never with any names given. I’m not a native but I speak Italian and can find any address in Naples, I don’t care how obscure. (I drive in Naples too.) And presumably these geniuses toiling in obscurity have telephones. So why are they such a secret? Don’t worry- I can give you names and Tel of such tailors))). Is it possible to contact me also your suggestions? I am not a local and I dont speak Italian, but I am in a relatively close distance from Naples. I want to make my first steps in the bespoke world and I am doing my research first until I visit Naples for a first time. Cheap? Not really but for sure you can obtain top quality bespoke at 1,5k/2k. In this range you’ll find o’mast (just look at some names at 197 via Chiaia) or young sartoria like Alessandro Guerra. There are plenty of options. Simon you mentioned, that you had something in the making with biagio granata. I am thinking of trying him out, and would just like to hear your thoughts on the work. We’ve had three fittings so far and it’s OK – not perfect, and there was an issue with trousers being adjusted in the wrong direction. But hopefully should turn out OK. I’ll withhold judgment until the final suit is ready. Ok. Thank for the info Simon. I like the fact that you withhold final judgement, we should always give the benefit of the doubt. Sounds like at difficult process but could turn out fine. I will consider using him. I rarely get what I want with the first suit. Maybe the next ones will be better. Just back from a week in Naples where we had a great experience having Biagio make a blue Huddersfield fresco suit for our 26-year-old son. (Possibly Biagio’s age as well.) Like you Simon we had three fittings and have not seen the finished suit yet, which will be shipped to my son in California. We felt Biagio’s attention to detail and fit was quite thorough—indeed moreso than I received during the week from Rubinacci where I was getting a suit in a vintage grey donegal cashmere. That could be due to Biagio being a relative novice as opposed to the much older and experienced cutter at Rubinacci; again no finished product yet. But he is certainly conscientious, and a lovely person as is his partner and shirtmaker Pasquale. The final total cost for the suit (cash only, no plastic) was €1700, including DHL to California (€99). The VAT issue is murky to me as both a non-EU citizen and a part-time resident of Italy where everything VAT-related is murky by definition. I believe Biagio must still pay some on his end as of course VAT is cumulative, but that €1700 was our total cost. Perhaps Brits will get hit with VAT on delivery? Incidentally that is Biagio’s Naples price. He told me he charges more on his trunk shows to account for travel expenses, but I didn’t ask how much. His English is quite limited; I can picture some potential cross-communications during fittings for customers who don’t speak Italian. Thanks Max. And yes, that has certainly been an issue with me. I ordered a Granata suit through Pasquale, who is the middle brother (Biagio is 31 or 32, Pasquale 28-29, and the youngest brother is 25-26) and did the trunk shows for Geneva. The whole process, which started in October, was good, although a bit chaotic (canceled flights and ensuing delays), and I had to resurrect my Italian from school, as English was posing serious obstacles. I picked up a few sartorial terms and from there it went more smoothly communication-wise. We developed a very good rapport in the process – they are very committed and took careful note of all my needs. I’m expecting a suit soon, which was finished with good first fitting but without proper second fitting (issues arose and they had to cancel the Geneva trip), which raises some doubts. However, they provided assurances that the suit will fit perfectly as they took every single measure and posture shot possible and the first fitting was very good. They promised if there are any issues the suit would be fixed on the next appointment. Will update on the result when the suit arrives – hopefully next week. Just wondering whether you’ve ever tried doing shirts at Camicceria Piccolo (#7 above) and/or if you had any thought about the quality of their MTM or Bespoke shirting (in case they do both). Thanks much. I am a big fan of Antonio Pascariello’s work but I can’t seem to find any information on him (address, website etc.) Does anyone have information? Thanks! Do you have a hotel recommendation for Naples? Do we need to make appoints for DAvino and other bespoke shirt makers ? I’m wondering what you think of Cesare Attolini. I’ve read through most of your blog but you never really mention the house. It’s surprising as you’ve obviously spent a lot of time in Napoli and the product is of a very high standard. I could also ask the same question of Orazio Luciano. I later realised that you have written an article about Orazio Luciano. I think Attolini do MTM, which you cover, and possibly do bespoke too. Although I imagine it’s very expensive. I’m assuming then that you don’t own any Attolini. I find I achieve a great fit, but then (fortunately for me) I’m not a difficult fit to begin with. Yes – not much in detail though. Attolini do do MTM, yes, but for that price I’d usually recommend bespoke to people. I have also covered Kiton MTM, which is more expensive than Attolini and I generally like the style of less, but the offering is similar otherwise. Perhaps worth having a look at that. Are there alternatives to get Caccioppoli fabrics in Naples? They don’t as standard, but try contacting them ahead of time and it might be ok.
No, that’s the only place to go…. I don’t think it’s a good idea. Naples is not good place to buy RTW))). Instead you can take measurements on first day , fitting in 2 days and after that they will sent to you finished product))). Some tailors can offer to you this service. I am searching a wholesale for men suit and men clothes in Naples.if you can guide me big thanks. Just wanted to add to the discussion on Granata. They seem like nice and honest guys, but it’s all a bit hasty and chaotic. They finished my suit without doing all the fittings (actually did just one), and sent it via post (I had to pay the shipping costs), and I was not too happy with the result, both in terms of fit and construction. They agreed to fix it all, but still waiting for their next trip to my town to see where all the alterations are needed and actually do a proper second fitting. I suggest making sure this is avoided and keeping in mind the possible waiting times and change of schedule (couple of times we were supposed to meet they had to cancel the trip). They are good guys I have no doubt, and the work I’ve seen online is superb (as are comments from others), but given my experience they must be more professional and understand this is a luxury business and needs to be treated as such. Very interesting article. One thing that stands out to me from it is that a visitor in Naples has great number of choices. So many that he can be easily lost. However, a visitor in Naples that does not live in Italy has the limitation of time. He can’t visit all the many suit tailors and shirt makers suggested in it. So I was wondering, for someone that has no idea about bespoke tailoring and shirtmaking where can he start his journey to the bespoke world when he visits the area for 3-4 days? Do the Neapolitan makers have a specific style for ties and is there much difference between the makers? I’ve been into the E. Marinella shop in London and seen Francesco Marino in person at the PS pop-up, but I’m also aware of Cappelli, Cilento, Ulturale, A. Quaranta Locatelli, and Calabrese 1924. Are there any of those you’d recommend more strongly than others? I’d like to experiment outside the very British (Drake’s) and Milanese (Bigi) styles I’m used to but the market seems a lot more heavily contested so to be honest I’m a bit confused as where to start. PS. A very very merry Christmas to you and best wishes for your first full year of running PS full time in 2019! 1) Are these gentlemen generally accurate when it comes their quoted times to complete work? 2) This would be a significant upfront investment with bespoke garments from Solito, Ciardi and Caliendo. My thought is to make the most out of this trip and get patterns done with these makers, in order to make future commissions more efficient. OR, would you suggest taking things a bit slower, maybe selecting just one garment to be made bespoke and see how it turns out? I don’t have an unlimited budget but I can allocate about 8-10 thousand USD each year for bespoke garments. I calculate I’m approaching double that if go with plan A for this trip. I’d be commissioning all basic items based on the many great articles you’ve written. Any advice on this would be appreciated. Youve identified some great makers, but I would worry about spending so much at one time, yes. I’d suggest you reduce it to one or at the most two. Even from one maker, I’d always recommend just doing one at a time, at least at the start. Hi there SIMON and folks . This is my first post . I’ve very much enjoyed reading this discussion . Last year 2018 my partner and I were in Naples for about 10 or 11 days , during that time we stayed at an apartment owned by the rubinacci family , about 20 mins walk from Chiaia ( this was a good location as we needed to “ walk off “quite a bit of food ! After reading up on bespoke tailors in Napoli I settled on Sartoria Tofani , a farther and son oppression that has yielded me a fantastic relationship and initially a suit that is beautiful , a jacket to match the Holland and Sherry ambrosia trousers whilst there and finally a beautiful cream dinner jacket and black trousers that I wore at my wedding this year . We live in Australia and are hoping to get back to see Ari and Davide for some follow up measurements and perhaps a linen suit . They have been easy to work with and have sent everything over here ( to Australia ) in the time frame we discussed . I feel like their work is the real Napolitan deal , the trousers fit beautifully and the jacket really does feel like a shirt . Has anyone else had experience with sartoria Tofani ?